6 Months Free is Limited to First 20 Customers. San Diego Businesses Only! 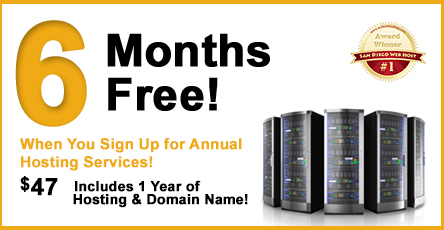 For a Limited Time we’re giving the next 20 customers 6 Months of Free Hosting when you sign up for our annual service. That’s 6 FREE Months of professional hosting services. How do you get the 6 Months Free? It’s Simple! Find the orange button above and click it to start. See all the hosting features you get and choose a domain name you want to register or transfer for your business. Your first domain name is included! Step 3 – Get 6 Months Free Hosting! Complete your subscription and get your domain name and access to San Diego’s Best Hosting Service Today! We’ve helped thousands of business owners get their start on the web. Our hosting is custom designed to give you the best tools for hosting (and creating) your website!